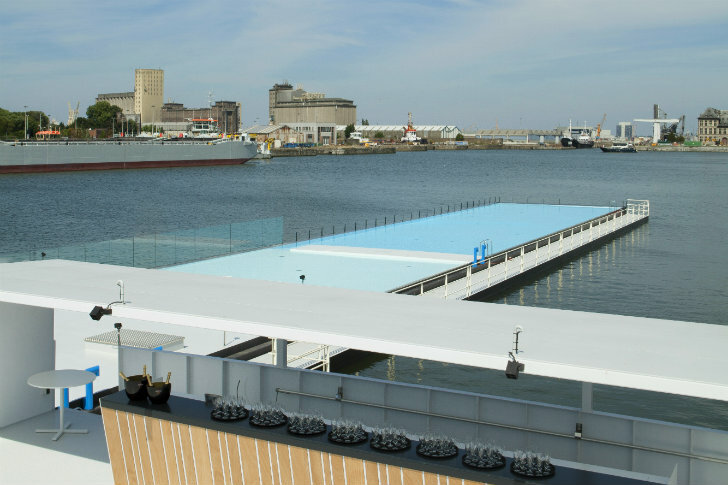 Badboot: The World's Largest Floating Swimming Pool Opens Today in Antwerp! 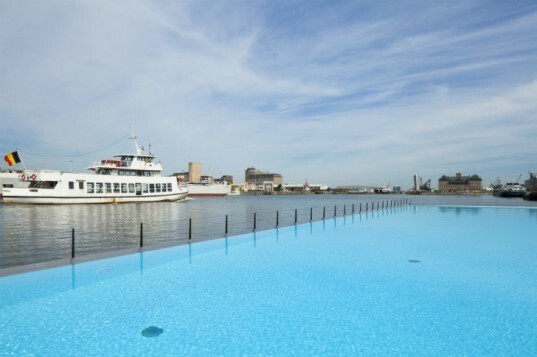 Badboot: The World’s Largest Floating Swimming Pool Opens Today in Antwerp! Antwerp, are you ready to get your swim on, because Badboot, the world's largest swimming pool, opened today in your city! Built from an old ferry boat, Badboot features a 120 meter long swimming pool, two event halls, a lounge terrace and a restaurant. Besides using reclaimed materials, the floating pool also features an innovative onboard reed bed water filtration system and energy saving strategies. The massive swimming pool and rec center were designed by Belgian firm Sculp(IT), and after only a year in the making, it is finally open to the public! The idea for Badboot originated only a year ago. In that short span of time a dedicated group of investors received support from the city, obtained an old ferry boat, were able to construct their pool, and then finally tow it into place in the Port of Antwerp. Sculp(IT) designed the project, and construction and fabrication were handled by Netherlands shipbuilder HSS BV from Maasbracht. Visitors to the floating destination can enjoy the Olympic-sized lap or kid’s pool, lounge on the deck, eat in the restaurant, or even rent the space for events. The project’s unbridled support is most likely due to its implementation of sustainable strategies, starting off with the use of a reclaimed ferry boat for its main infrastructure. A low-maintenance design and green furnishings ensure the facility is durable and long lasting, while water efficient fixtures reduce water usage by 60%. Badboot is also outfitted with LED lighting, and a heat pump brings the water up to 28-29 deg C. But the coolest part of the project has to be the onboard reed bed water filtration system – it’s the only one of its kind in Europe. The wastewater from the showers, toilets, the restaurant kitchen and the swimming pool’s washroom are purified in the reed bed, which is artfully lit and becomes an aesthetic complement to the structure. Badboot officially opened today and will be open seven days a week through mid-September. The pool will reopen during the colder winter months as a skating rink. woah!!! this is nice I want to go here.. The idea for Badboot originated only a year ago. In that short span of time a dedicated group of investors received support from the city, obtained an old ferry boat, were able to construct their pool, and then finally tow it into place in the Port of Antwerp. Sculp(IT) designed the project, and construction and fabrication were handled by Netherlands shipbuilder HSS BV from Maasbracht. Visitors to the floating destination can enjoy the Olympic-sized lap or kid's pool, lounge on the deck, eat in the restaurant, or even rent the space for events. The project's unbridled support is most likely due to its implementation of sustainable strategies, starting off with the use of a reclaimed ferry boat for the main infrastructure. A low-maintenance design and green furnishings ensure the facility is durable and long lasting, while water efficient fixtures reduce water usage by 60%. Badboot is outfitted with LED lighting, and a heat pump brings the water up to 28-29 deg C. But the coolest part of the project has to be the onboard reed bed water filtration system - it's the only one of its kind in Europe. The wastewater from the showers, toilets, the restaurant kitchen and the swimming pool’s wash are purified in the reed bed, which is artfully lit and becomes beautiful design complement to the structure. The coolest part of the project is the onboard reed bed water filtration system - the only one of its kind in Europe. The waste water from the showers, toilets, the restaurant kitchen and the swimming pool’s wash are purified in the reed bed, which is artfully lit and a beautiful design aspect to the facility. Location of Badboot in Port of Antwerp.